Bottle caps are a new favorite toy at our house, so much so that they are sometimes fought over…as though fifty-eight gazillion bottle caps aren’t enough for two kids! They get scattered about my house and deposited in odd places, like between couch cushions, pillow cases and fireplace vents, and for a few days my son insisted on sleeping with all the green milk caps. Funny kids. Aside from the mess and surprise of finding them in your shoes, bottle caps are also a great educational manipulative at our house. 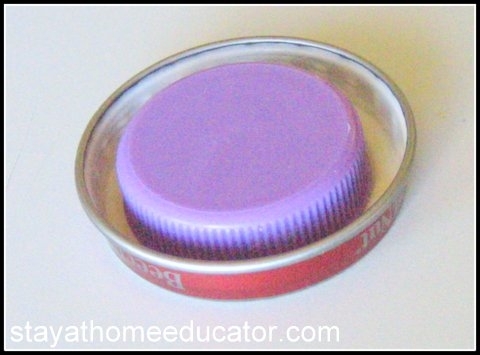 Click here for my post on six ways to sort bottle caps. Most commonly bottle caps are used for sorting activities, but I wanted to share some ideas to encourage using them for size sequencing. Since bottle caps come in so many sizes, they are the perfect tool for size sequencing. Larger caps can be found on peanut butter and cookie jars. Medium size lids can be found on bulk size spice containers and syrup bottles. Baby food jars are smaller, and water bottle caps are usually the smallest. Depending on the age of your child, you many find that the above example of size sequencing to be too overwhelming or difficult for your child. So, simply it according to what you think will be basic enough for your child to experience success as well as challenge. Sometimes it is difficult to determine which cap is larger if they are very close in size. I recommend placing one cap inside the other to show size differences. Don’t forget that bottle caps can also be sequenced by height. If you look closely at the picture you can see a grid in the background. I used a cutting mat to show the varying height of the bottle caps, which is necessary for most young children to identify the height differences. You preschooler may struggle with this concept at first, because children grasp size sequencing more easily than height sequencing. Notice in the picture that the largest cap by size is not the tallest. Reorganizing the caps by height will most likely take more practice. What a great conversation about measurement can begin here! Sequencing helps children organize information into a predicable pattern and it helps them understand structure within their environment. Larger and smaller, taller and shorter are also basic measurement skills that influence number sense skills. For more ideas about size sequencing, check out Prekinders website. Amazing ideas over there! « What Does Writing Practice Look Like in Preschool? Great idea! We just did some bottle and cap matching and this would be a great extension! Awesome! This is a great idea! We just did recycled bottle and lid matching. This would be a great extension idea! Thanks for sharing! Fantastic idea! My little boy loves making patterns with objects. Sorting is such a great early science activity! Thanks for linking up to Science Sunday. Thanks for posting the various images. I must confess though that I have been looking for bottle caps like the BLACK one in vain for quite some time, ie until finding your post. For what specific product and brand was that black cap used please? I think the black bottle caps are from Poweraid bottles. Wondering if you will put a search box on your site? I saw a popular post on building bridges, but now can’t find it. Thanks for sharing all your knowledge and helping teachers!